O, that this too too solid flesh would melt, / Thaw, and resolve itself into a dew, / Or that the Everlasting had not fixed / His canon ‘gainst self-slaughter. O God, God, / How weary, stale, flat, and unprofitable / Seem to me all the uses of this world! 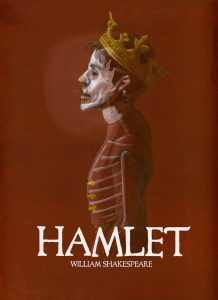 As Hamlet faces the conflicts and disorder in the royal court, he considers his own place in these events. In this, his first soliloquy, he wishes he could simply melt away and avoid the monstrous deeds which lay ahead of him. He would commit suicide if it were not a damning sin, so he longs to become nothing at all and fade away. The world is “weary, stale, flat, and unprofitable.” He therefore wishes to turn away from life and ultimately from his own being. Hamlet, speaking to Rosencrantz and Guildenstern, describes the god-like qualities of humanity. He describes the noble and divine aspects of humanity: reason, the faculty of imagination, and the physical perfection of humanity. But, like all features of life to Hamlet, he sees nothing remarkable about humanity. We are nothing but a “quintessence of dust,” or a mere collection of elements that will one day die and become nothing at all. Hamlet is incapable of seeing anything noble or virtuous in life. His own self-doubt has caused him to see everything as tainted and fleeting. To be, or not to be, that is the question: / Whether ’tis nobler in the mind to suffer / The slings and arrows of outrageous fortune, / Or to take arms against a sea of troubles, / And by opposing end them. To die, to sleep — / No more. And by a sleep to say we end / The heartache, and the thousand natural shocks that Flesh is heir to. ‘Tis a consummation / Devoutly to be wished. To die, to sleep — / To sleep, perchance to dream. Ay, there’s the rub. / For in that sleep of death what dreams may come / When we have shuffled off this mortal coil / Must give us pause. Act Three scene one, ll. 56-68 ff. Possibly the most famous quotation in English literature, this is the central moment when Hamlet draws the very idea of “being” into question. He asks simply whether or not it makes any difference if he faces the difficulties and struggles of life when he will eventually die anyway, or simply turn away from the realities of life and end himself on his own. He idealizes death as an eternal sleep in which we will dream of all eternity, and in this, he considers this to be the best option. This question of to live or not to live is the underlying philosophical question of existentialist philosophy.